Fairfax, hub of traffic, adopts master plan for bikes from the Washington Post: "Fairfax County is moving to make cycling a bigger part of its landscape, with a master plan that would allow for more than 1,000 miles of new cycling routes over the next 30 years. 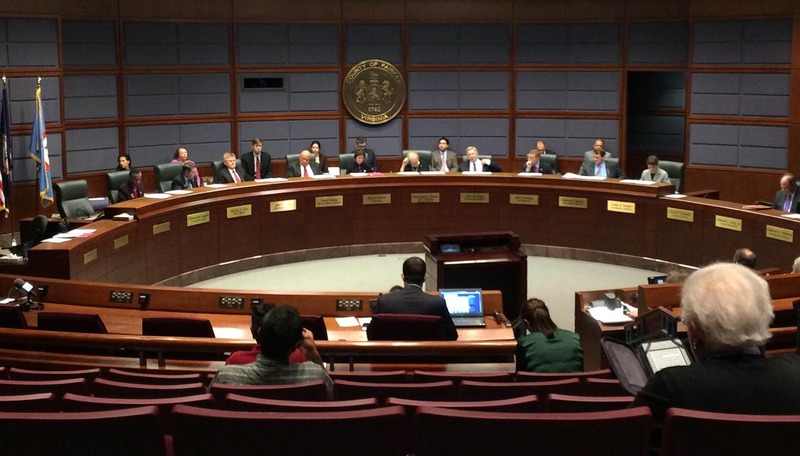 The plan, which would quadruple the mileage of existing bike paths and lanes, was unanimously approved by the Fairfax County Board of Supervisors on Tuesday night. It is part of the county’s effort to redefine a jurisdiction long known as a hub for traffic congestion." Fairfax County Bike Master Plan Passes Unanimously! from WABA. Thanks to Greg Billing, WABA's Advocacy Coordinator, for testifying in support of the bike plan at the public hearing: "Building a bike-friendly community starts with a plan and strong commitment from elected officials. Fairfax County Board of Supervisors made a important endorsement of bicycling for recreation and transportation. Chairman Sharon Bulova said, 'bicycling is not only for recreation, but for transportation' citing the full bike racks at the new County bike parking facility at the Wiehle Ave Metro Station." 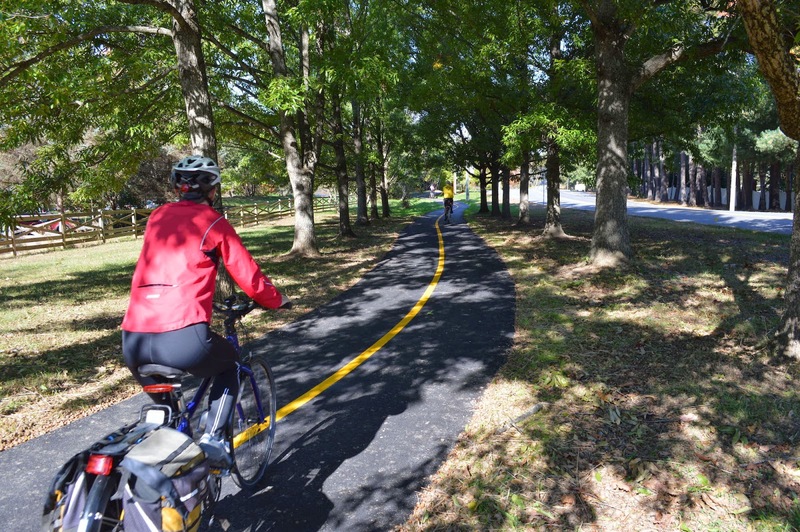 Fairfax County Adopts its First Bicycle Master Plan, the Fairfax County News Release: "These new facilities will take the next 10 to 30 years to install or complete. However, many on-road lanes can be created just by reconfiguring existing road markings. In fact, almost all of the county’s existing on-road bike lanes were installed at no cost through the Virginia Department of Transportation’s annual repaving program." Bike Lanes May Soon Get A Boost In Fairfax County from WAMU, which contains two quotes; from one of the 17 people who signed up to speak in support of the plan, and from a person who wandered into the meeting, didn't sign up to speak, and wasn't shy in saying he hadn't read the plan. 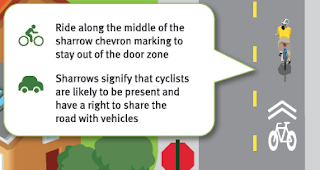 Sharrows were recently placed on Lawyers Road between Twin Branches Rd and the beginning of bike lanes near Myrtle Lane. This is a stretch of narrow road with heavy traffic that many cyclists use to connect the Lawyers Rd bike lanes with Twin Branches Rd and Hunter Station Rd. 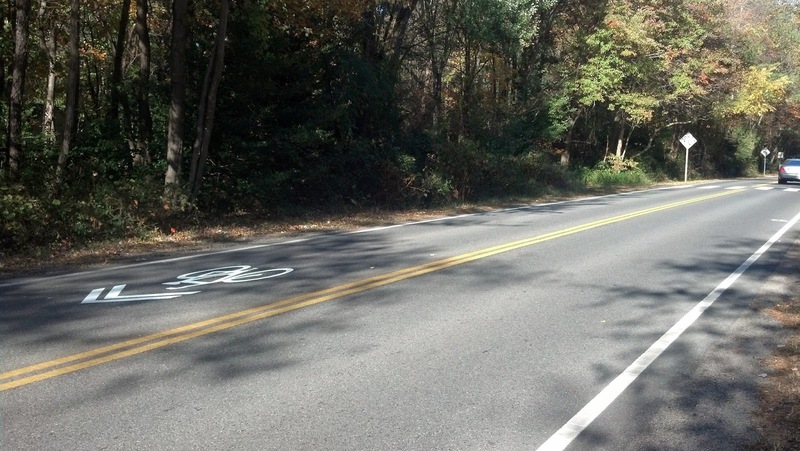 Thanks to VDOT for responding to requests from cyclist, and thanks to area cyclists who took the time to contact VDOT and ask for the markings. 02 The Shared Lane Marking should not be placed on roadways that have a speed limit above 35 mph. 03 Shared Lane Markings shall not be used on shoulders or in designated bicycle lanes. 04 If used in a shared lane with on-street parallel parking, Shared Lane Markings should be placed so that the centers of the markings are at least 11 feet from the face of the curb, or from the edge of the pavement where there is no curb. 06 If used, the Shared Lane Marking should be placed immediately after an intersection and spaced at intervals not greater than 250 feet thereafter. 07 Section 9B.06 describes a Bicycles May Use Full Lane sign that may be used in addition to or instead of the Shared Lane Marking to inform road users that bicyclists might occupy the travel lane. We are looking forward to receiving feedback from FABB members! See press coverage of the bike plan adoption below. At their meeting today the Fairfax County Board of Suprvisors unanimously adopted the county's first-ever bicycle master plan. The plan is now officially incorporated into the Transportation component of the Comprehensive Plan. Thanks to the Board and the Planning Commission for their unanimous support of the plan. A special thanks to everyone who took the time to attend the final public hearings and who testified in support of the plan. Thanks also to the over 850 people who signed the FABB/WABA petitions. The process started in 2009 with Supervisor McKay's motion for the Board to endorse the concept of a bicycle master plan. Thank you Supervisor McKay! Thanks also to county staff for their hard work on getting the plan completed and incorporated into the Comprehensive Plan. 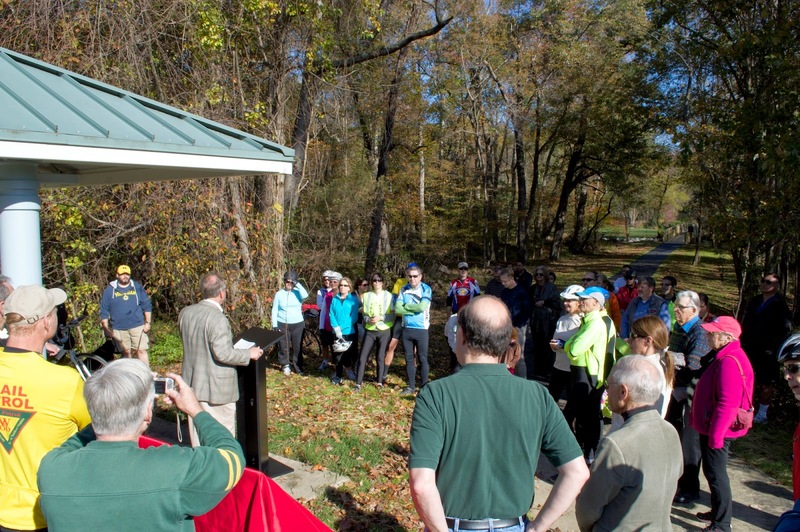 It helped greatly that the plan was supported by several groups including the Trails and Sidewalks Committee, Transportation Advisory Commission, Environmental Quality Advisory Council, Partnership for Healthier Fairfax, the Towns of Herndon and Vienna, Reston Association, WABA, and George Mason University. As stated in the Staff Report, "The bicycle facility and policy recommendations included in this Comprehensive Plan amendment represent a shift in how bicycle planning and design will be approached in Fairfax County. Moving forward, it is assumed and expected that bicycles will be treated as valid users of the roadway and accommodated as a necessary element of all roadway improvement projects." Where: From Franklin Farm Road to West Ox Road. 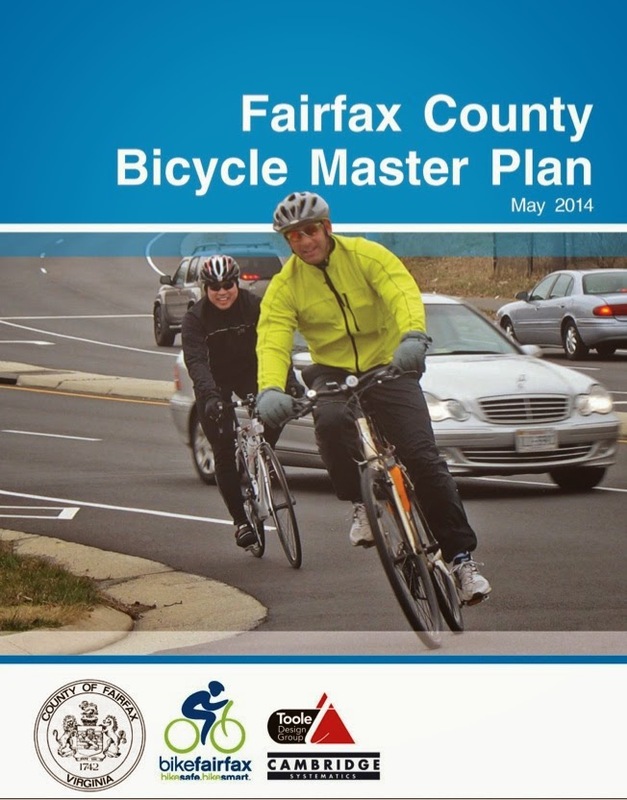 On Tuesday the Fairfax County Board of Supervisors is holding the final public hearing on the Bicycle Master Plan. Thanks to everyone who attended the Planning Commission hearing where the plan was unanimously supported. This is the end of a five year process of developing the county's first bike plan. The hearing on Tuesday, October 28 will be held at the Fairfax County Government Center Board Auditorium. located to the right of the main entrance. The public hearings begin at 3:30 p.m. and the bike plan hearing is ninth on the list. It's impossible to say when the bike plan hearing will begin; the other hearings will likely take more than an hour. We will be tweeting status of the prior public hearings on the FABB twitter feed and Facebook account. The hearings are also televised on FFX Channel 16. Looking on the positive side, sitting through the hearings is always an interesting way to experience local politics. Several of us from FABB and other organizations plan to speak. We'd like you to join us; just being in the room shows your support for the plan. As we did at the Planning Commission hearing, we'll ask supporters to stand during the FABB testimony. Some of us plan to ride to the hearing and bring our helmets into the meeting room. There is bike parking at the entrance to the building. We hope to see you at the hearing. Meadowlark Botanical Gardens is owned and managed by the Northern Virginia Regional Park Authority, the same organization that owns the W&OD Trail. The two parks are within a mile of each other. They will soon be connected by a new paved trail. 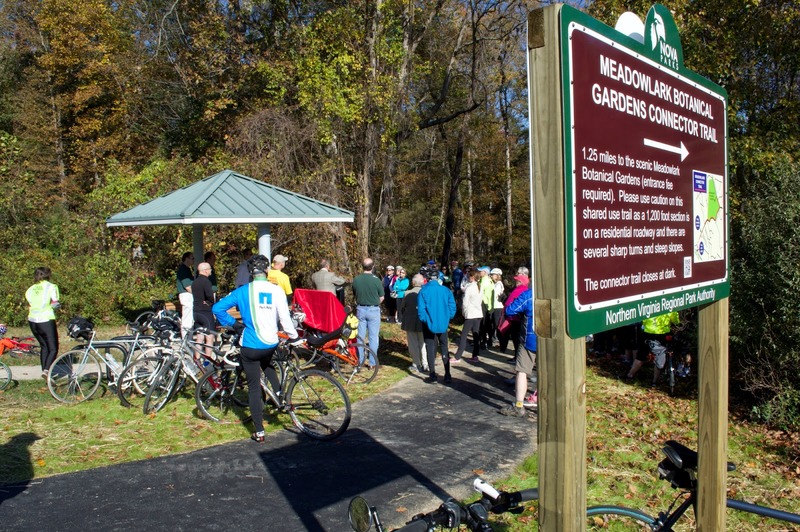 On Saturday October 25th at 10:30 Northern Virginia Regional Park Authority (NVRPA) will host a ribbon cutting for the W&OD to Meadowlark Connector Trail. They will also be dedicating an interpretive sign donated by the Rails-to-Trails Conservancy. The connector trail is near mile marker 14.5; between Vienna and Hunter Mill Road. Rails to Trails Conservancy is holding a ride that begins at the Connector trail. 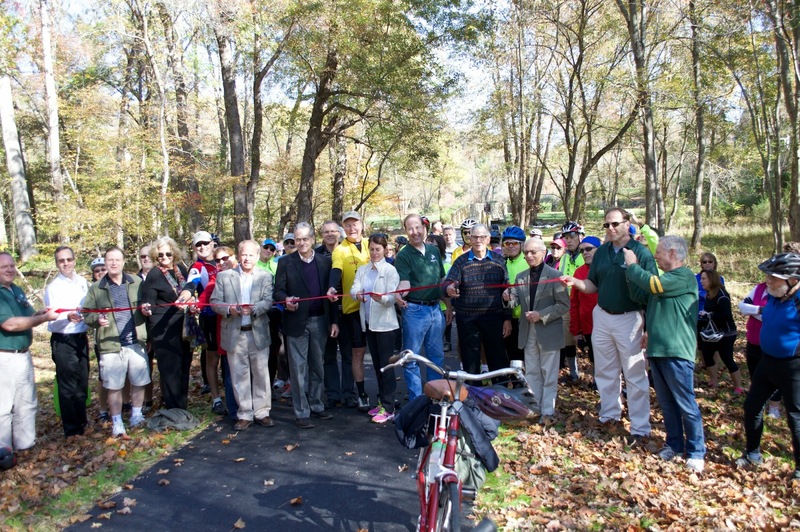 The ride begins after the ribbon-cutting and follows a 12-mile route from the Connector trail to Herndon, with a stop at Green Lizard Cycling before returning. See detailed plans for the trail. We are encouraging everyone to vote YES for the 2014 Transportation Bond on November 4. $6 million in bicycle projects, $78 million in pedestrian projects, and $16 million in spot road improvements will be funded by the bond. See a detailed list of projects. These projects will help make biking and walking conditions safer for everyone. Update; See the Fairfax Times letter to the editor from the Partnership for a Healthier Fairfax Transportation bonds will make Fairfax a safer place. Update 2: The League of Women Voters also supports the bond in their letter Transportation bond benefits Fairfax in Fairfax Times. Where: From Sunrise Valley Drive to Dulles Toll Road. On Monday, October 20 Fairfax County is holding and information meeting on the proposed Vesper Trail. The trail will provide direct bicycle and pedestrian access from communities in north Vienna to the Spring Hill Metro Station in Tysons. In the image on the right the trail is indicated by the green line between 24 and 17. On October 20th, Supervisor Cathy Hudgins and Fairfax County Department of Transportation (FCDOT) will be hosting an informational meeting to discuss the Vesper Trail transportation facility. The meeting will begin at 7:30 p.m., at Westbriar Elementary School (1741 Pine Valley Drive, Vienna, VA 22182). Vesper Trail is an important link between the Tysons transit area and northern Vienna neighborhoods. FCDOT staff will discuss the project background, current progress, and timeline to completion. If you have any additional questions, please feel free to contact the Hunter Mill District office at 703-478-0283. Update 21 Oct 2014 - Several Fairfax County staff attended the meeting as did several residents and other interested parties. Comments were generally favorable regarding the trail. Concerns were expressed about the types of lights planned for the trail. People wanted to avoid seeing the light from their houses as much as possible, although I think everyone agreed that lighting was a good thing. Other concerns were expressed about the lost of a few trees due to placement of a bridge. People wondered why stream restoration wasn't occurring during the same time frame, but that work is not funded whereas the trail is fully funded. From my understanding of the process, stream restoration will likely lead to extensive loss of tress. We were encouraged that the trail will be lighted and that current plans include plowing snow that accumulates on the trail in the winter. 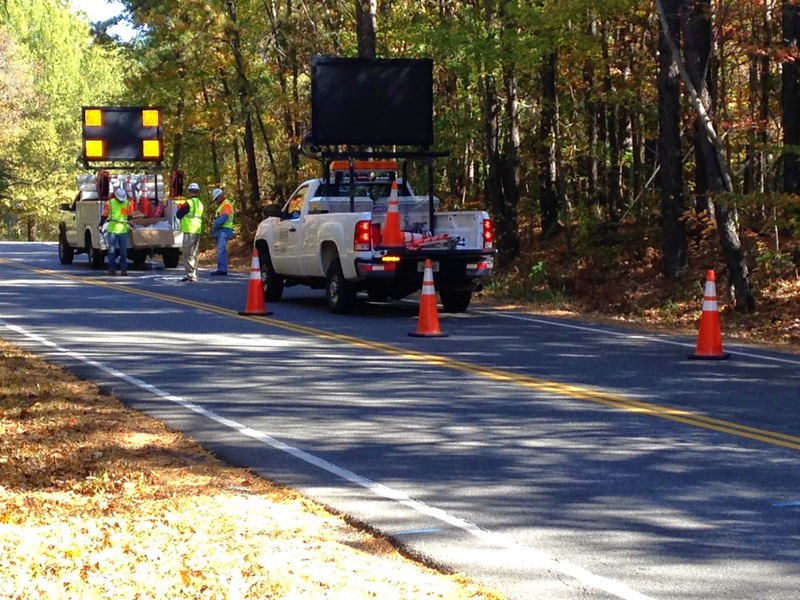 We just learned that maintenance/repair work on the Fairfax County Parkway Trail started up again today. 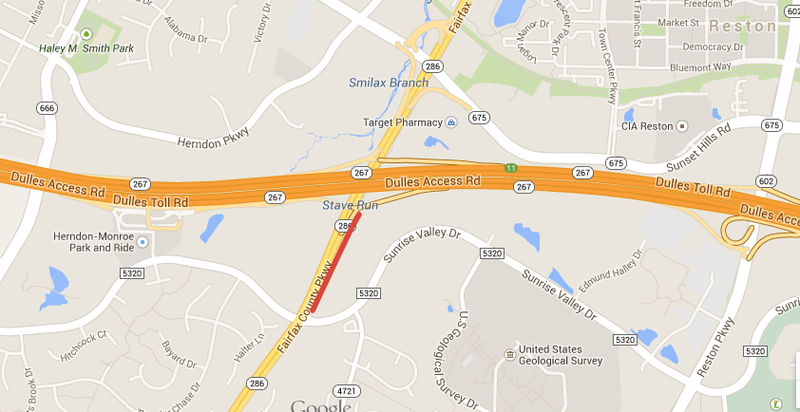 As a result, the trail is closed just north of Sunrise Valley Dr up to just south of the eastbound Dulles Toll Rd ramp. If you're riding south and encounter the barrier, you will have to backtrack all the way to Sunset Hills/Spring St near the Target to find an alternate route. You could also try to make your way through the closed trail section. As you can sort of see from the map image above, there are not many alternative routes to bypass the closed trail section. You could ride east to Reston Parkway or west to Monroe Street. You should be able to click on the map to see the google map version. We've asked that the north Trail Closed barrier be placed closer to the decision point for using an alternate route; at Sunset Hills/Spring Street. Millennials are "driving less; taking transit, bik- ing and walking more; and seeking out places to live in cities and walkable communities where driving is an option, not a necessity" according to a new report entitled Millennials in Motion. This trend has major implications for how we spend our transportation dollars in the future. Most local jurisdictions are now basing their spending on outdated models that assume nearly everyone will drive in the future. Numerous road projects will be built in the near future based on these projections. Now is the time for the nation’s transportation policies to acknowledge, accommodate and support Millennials’ demands for a greater array of transportation choices. Between 2001 and 2009, the average number of miles driven by 16 to 34 year-olds dropped by 23 percent, as a result of young people taking fewer trips, shorter trips, and a larger share of trips by modes other than driving. 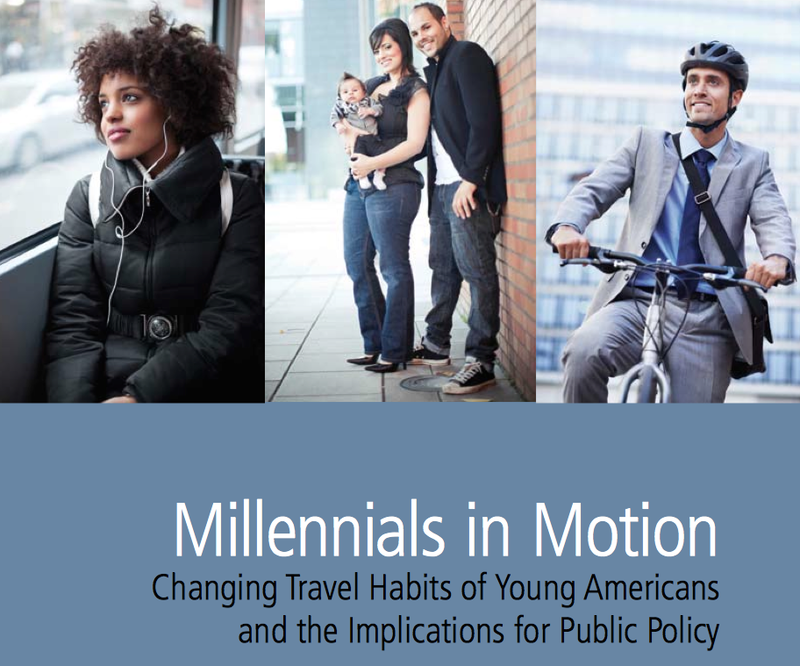 Young Americans drive less than older Americans and use public transpor- tation more, and often use multiple modes of travel during a typical day or week. Census data show that the share of 16 to 24 year-olds traveling to work by car declined by 1.5 percentage points between 2006 and 2013, while the share of young people getting to work by public transportation, on foot or by bi- cycle, or else working from home, had increased. Driver’s licensing among young people has continued to decline. The percentage of high school seniors with driver’s licenses declined from 85 percent to 73 percent between 1996 and 2010, according to the AAA Founda- tion for Highway Safety, with federal data suggesting that the decline has continued since 2010. The Fairfax County Park Authority is updating their Needs Assessment. The effort is called Parks Count! In the 2004 Needs Assessment report there is no discussion of bike access to parks. The only mention of bikes is on unpaved bike trails. This is a great opportunity to let the Park Authority know the importance of good bicycle access to the parks and the need for bike parking. After collecting ideas and initial input, the Park Authority will "design and send a survey to almost 15,000 randomly selected Fairfax County households in early 2015." Better bicycle access to parks: Most of us live within a short distance of nearby parks, and yet accessing our parks by bike is often not easy. We need safe, direct bike access into the parks, and good bike parking when we get there. The topic with the most votes, 8, is Horseback Riding on more trails. The above idea has 1 vote. 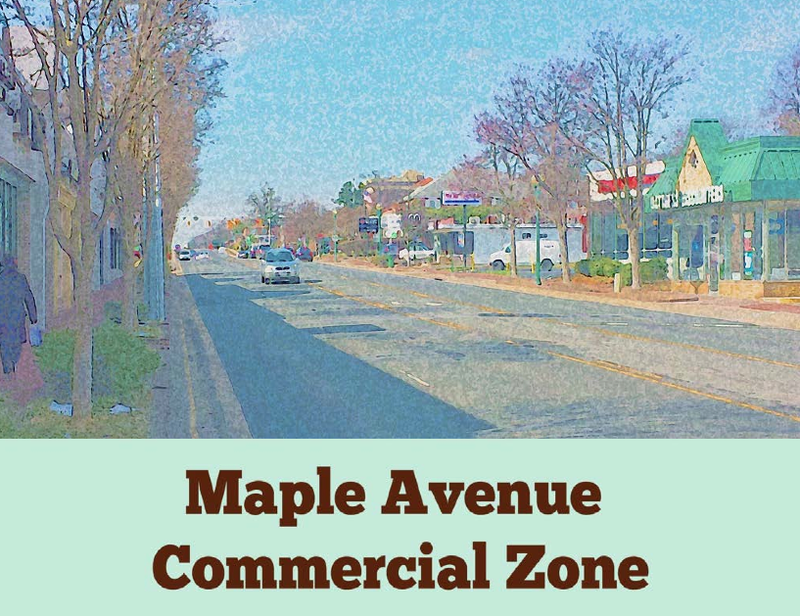 At their September 22 meeting the Vienna Town Council approved the Maple Avenue Commercial Zone Regulations that will "Encourage compact, pedestrian-oriented development along Maple Avenue East and West that collectively accommodates residents, visitors, and businesses." We hope the new regulations will help remake Maple Avenue from a thoroughfare for commuters to a more vibrant, livable place. The new regulations include bicycle parking requirements. While we're encouraged by the new requirements, they are minimal compared to those in Arlington although similar to those proposed in Fairfax. As an example, visitor parking can be located as far as 150 feet from the building entrance compared to 50 feet in Arlington and 50-100 feet in Fairfax. Arlington requires "One (1) resident bicycle parking space for every three (3) residential units." Vienna will require only one parking space for every ten units, the same as what is being proposed for Fairfax. That means that 9 out of 10 units will likely have no bike parking. Also, we saw no reference to the type of racks required. Inadequate bike parking is one of the major hurdles to resident's ability to use bicycles for short trips. If it's difficult and inconvenient to park and access your bike, chances are you won't ride. Changing the character of Maple Ave will be a challenge. With so many people still relying on cars to get around, the street will continue to be congested throughout the day. Better transit, more bike-friendly streets, and more mixed-use development will eventually help but it will be a long, slow process. The Maple Ave Vision is a step in the right direction. The Fairfax County Planning Commission voted unanimously tonight to approve the county's first-ever Bicycle Master Plan. Thanks to the Commission for their strong support for the plan and to Commissioner Hedetniemi for leading the effort. Thanks to everyone who supported this planning effort over the past five years, especially Supervisor McKay who presented the Board Matter asking staff to begin the planning process. Thanks to everyone who spoke very effectively at the Commission public hearing two weeks ago, and thanks to the 822 people who signed the FABB bike plan petition that we presented to the Commission this week. Thanks also to those who wrote to the Planning Commission in support of the plan. The final step in the approval process will be adoption by the Board of Supervisors. They will hold a public hearing on Tuesday, October 28 some time after 3:30 p.m. Several supporters representing a wide range of interests are lined up to speak in support of the plan. We'd like you to join us at the hearing to show your support. We'll post more info about the hearing as we get closer to the 28th hearing date. The Bicycle Master Plan text consists of 6 chapters. Four of the chapters deal mostly with the physical bike network. Chapters 5 and 6 are Bicycle Program Recommendations and Implementation. Without those elements the plan will fail. While Chapters 5 and 6 were not incorporated into the Comprehensive Plan, they were endorsed in concept and will be part of Appendix 5 of the Transportation Policy Plan. Some changes were made to the plan and map and we hope to post info about those changes in the near future. We were encouraged by comments made by Commissioner Ulfelder of the Dranesville District who said that Chapters 5 and 6 were key to implementing the plan and to success in the long run, which will require more staff and other resources, including maintenance funds. We agree. We don't want a plan that will sit on a shelf. Passage of the plan implies that resources will be made available to implement the important recommendations included in the plan. Tonight's FABB meeting will be held at the Fairfax County Government Center, 12000 Government Center Parkway Fairfax, VA 22035, room 232 at 7:00 p.m. This is a change from our usual location and time for the meeting so that we can attend the Planning Commission meeting held in the same building at 8:15 p.m. The Planning Commission deferred action on the bike plan at their Oct. 1 meeting. They will discuss the plan and take a final vote tonight. Everyone is welcome to attend both the FABB meeting and the Planning Commission meeting. We hope the bike plan discussion will be held early in the meeting. Wednesday, October 15, 2014, 7:00 p.m.
• October 28, Tuesday - Board of Supervisors Bicycle Master Plan public hearing, 4pm? 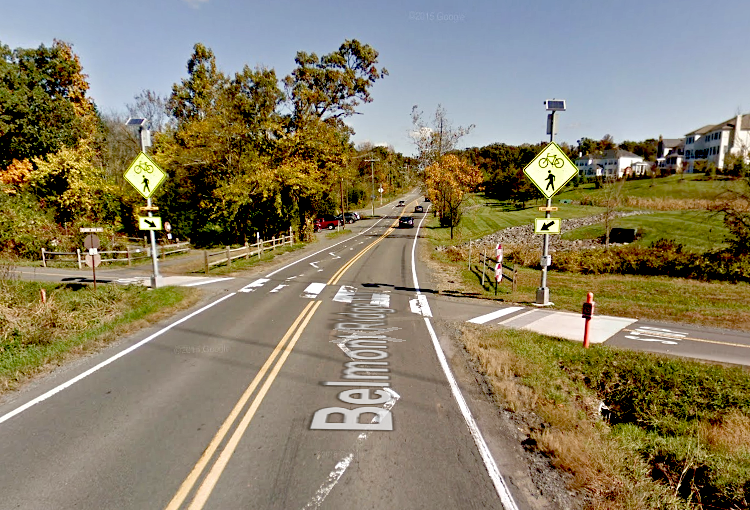 We discovered a new bike lane on U.S. Geological Survey Dr. in Reston. The road was recently repaved and a southbound bike lane was striped. It was a little surprising that there was no bike lane in the northbound lane. There is a paved trail adjacent to the northbound lane. Many cyclists ride to work at the USGS. For at least 8 years in a row USGS was the company/organization with the most Reston Bike to Work Day participants. The bike lane is a welcome addition to bike facilities in Reston. One day we hope it will connect to bike lanes on adjacent roads Sunrise Valley Dr and South Lakes Dr that currently do not have bike lanes. We also noticed an unusual symbol in the bike lane. Instead of the official bike lane symbols placed inside the bike lane, two chevrons are placed above the bike symbol, similar to those used in the shared lane marking. It would be nice if road markings were consistent. I believe this is a rare instance in which the road work was completed by Federal Highway Administration since the road is located on Federal property. This hasn't been a great long weekend for biking (for those of you who don't have to work on Columbus Day). There was light drizzle on Friday, Saturday, and for most of today (Monday). Not great riding conditions, but not really that bad. We rode to the Reston Farm Market on Saturday, using the W&OD Trail for about 2 miles and we didn't see another cyclist. The rain was very light and it was a pleasant ride, especially since we had the trail mostly to ourselves, along with a few runners and walkers. Today was the same story. One advantage we have other most other riders is that we believe in fenders (when I worked in a bike shop a while back I was surprised how many people don't know the term "fender") that keeps water, sand and mud from splattering on our shoes and back when the roads and trails are wet. In places like Portland, Oregon and Seattle, Washington, if you don't ride in the drizzle, you won't ride for a good part of the year. If you don't have fenders, why not try them. They are a great addition to the bike and they don't cost much. One of the leading real estate services firms, Cushman & Wakefield, released a report on development patterns in the DC area, Urban Development: Faster Greener Commutes Key to Sustained City Growth. The report stresses the popularity of transit-oriented developments both within cities and in some suburban areas like Tysons. While Fairfax County has placed an emphasis encouraging future growth in transit-oriented developments, the question could be asked whether Fairfax County is doing enough to ensure that these new developments are walkable and bikeable. The Mosaic District is touted as an example of good mixed-use development near transit, but walking and biking conditions in the Gallows Road/Lee Hwy area are dangerous and unfriendly, with wide streets, fast traffic, and almost no dedicated space for cyclists. WASHINGTON, October 7, 2014 – Cushman & Wakefield today released a special research study detailing Washington, D.C.’s expanding transit system and development plans for keeping pace with the rapid population increase since 2000. The “Urban Development: Faster Greener Commutes Key to Sustained City Growth” report explores the trends, consequences and solutions of hyper-urbanization in 10 major North American cities: Washington D.C., Mexico City, Manhattan, Los Angeles, Chicago, Toronto, Miami, Atlanta, Boston and San Francisco. Population growth is not confined to the city center although population in the District proper is at its highest level in four decades. Projects in the downtown core, or along transit hubs in the suburbs, which offer the live/work/play lifestyle, are attracting businesses and residents alike. DC ranks first in the U.S. among all urban areas in terms of wasted time commuting: a total of 67 hours per year, per commuter. Commuters in the District of Columbia are second only to New York City in terms of walking, biking or using public transport—D.C. government aims for 75% of all commutes to be within these modes, shrinking auto use among commuters from 42% to 25% by 2032, a goal no major city has yet attained. Long-term plan for Tysons calls for 75% of new development within a half mile of a Metro station. Montgomery County has a potential 13 million square feet of commercial space and 14,000 residential units within three quarters of a mile of the Red Line’s White Flint Metro stop. Most notable among the report’s conclusions is the premium placed on sustainable, transit-oriented development in downtown cities and the dramatic surge in suburban communities now fully-embracing the live-work-play model as a result of geographical nuances. In April 2013, Maryland and Virginia were among 31 other states to pass legislation to enable public/private partnerships to be established for transportation projects. Virginia was an early leader in these partnerships and has evolved into a national role model. Real estate occupiers and investors are seeking accessible locations close to where the millennial generation – expected to make up more than half of the global workforce by 2020 – live, thus driving the construction of the Transit Oriented Developments (TODs). In the Washington region, the report highlights four key mixed-use developments, which are all located very close to Metro stations: CityCenterDC, The Yards in Southeast, Capitol Crossing and the Wharf. “Transit oriented development (TOD) is the most substantial development trend of the early 21st century,” said Christopher B. Leinberger, the Charles Bendit Distinguished Scholar and Research Professor of Urban Real Estate, Chair of the Center for Real Estate and Urban Analysis at the George Washington University School of Business and President, of LOCUS: Responsible Real Estate Developers and Investors. “As Cushman & Wakefield points out in its Urban Development research report, this trend is a majority and in some cases the vast majority of new commercial development, as well as residential development, in many Metro areas today,” said Leinberger. The Sustainable D.C. Plan lays out a strategy to have 75% of all D.C. commutes taking transit, biking or walking by 2032. “Re-orienting our transportation spending toward rail and bus transit, biking and walking are the most important infrastructure investments North American metropolitan areas can make,” said Leinberger. “As the C&W research shows, this new walkable urban development is occurring in both our central cities and urbanizing suburbs. Following the research findings will lead to rental and cap rate premiums that will not be ignored by investors and developers,” concluded Leinberger. 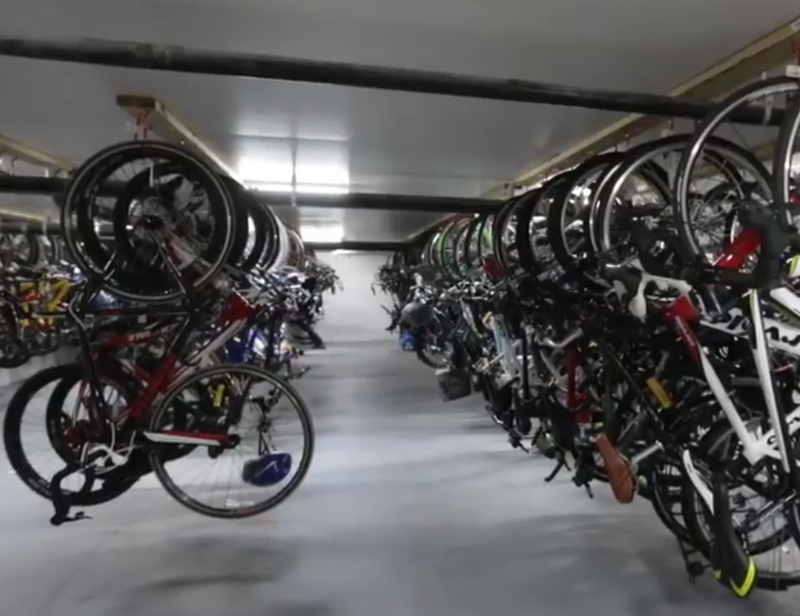 According to the Wall Street Journal article Developers Build Luxury, Bike-Friendly Buildings, with the surging popularity of biking, some developers are finally providing state of the art bike parking for their tenants. All too often bike parking provided by developers has been inferior, both in quantity and quality. It's encouraging to see that some developers realize that in order to attract cyclists, they need to provide much better bike parking. A bike valet will offer tuneups and tire changes to spandex-clad commuters and residents at Hassalo on Eighth, a multiuse residential and office complex in Portland, Ore., expected to be completed next year. At the new Vélo North Loop, a high-end rental building in Minneapolis, tenants can use the "bike kitchen"—a bicycle repair area with tire pumps and spare chain links, as well as a bike wash. A shop with trail maps and energy bars is in the works. The Cliffs, a series of golf-resort communities in North and South Carolina, has enlisted a 17-time Tour de France rider to offer group rides for homeowners and potential buyers through the surrounding countryside of the Blue Ridge Mountains. Other than in Tysons, Fairfax County does not yet have bicycle parking guidelines. As we've noted many, many times before, the county has been working on developing bike parking guidelines since 2007. Even when those guidelines are approved, the requirements are minimal. Let's hope market forces, i.e. tenants who demand better bike parking, will lead to developers understanding the importance of quality bike parking. See an earlier article in the Post about good bike parking in DC area apartment buildings. Wednesday, October 8 is International Walk to School Day. Students, faculty, and staff are encouraged to walk and bike to school, and motorists should be especially cautious driving around schools. By my rough count of events listed on the Walk to School page, there are 37 schools in Fairfax County participating. Rain is forecast for tonight but tomorrow should be sunny and mild, an ideal day for the event. If you get up really early you might even be able to view the total lunar eclipse just as the sun rises. Fairfax county is studying redevelopment of the Seven Corners area, a densely populated area where several major roads converge. Navigating through the area is a challenge for cyclists and motorists. Cyclists are encouraged to attend the Mason District Council 7-Corners Forum tonight at 7:30 p.m. at Sleepy Hollow Elementary School to ask how safe bicycling conditions will be incorporated into the plan. As background see the Seven Corners Visioning site that includes links to various planning documents. The Existing Conditions report notes the challenges faced by bicyclists. It also contains an old excerpt from the Bicycle Master Plan for that area. Instead of showing Routes 7 & 50 as "Policy Roads," as depicted in the report, the current bike plan recommends parallel shared use paths on Route 50 and a cycle track on Route 7. The Route 1 Multimodal Alternatives Analysis is a study to enhance mobility along a 15-mile segment of Route 1 between the VRE station in Woodbridge and Huntington Metro Station. Join us at the upcoming public meeting to learn about the study's findings and recommendations for improved transit, roadway, bicycle, and pedestrian facilities along Route 1. See more info about the meeting. At last night's public hearing on the Bicycle Master Plan, the Planning Commission deferred action on the plan until their October 15 meeting. During the hearing approximately 15 people spoke in support of the plan and no one spoke in opposition. Another large group of supporters were present who did not speak. Thanks to everyone who took the time to support the plan. It was a very long night but the commission heard loud and clear that a broad spectrum of the community supports the plan. Despite a five-year long process of community meetings, advisory committee meetings, focus groups, and area-wide meetings, at the end of the hearing Commissioner Murphy from the Springfield District said that in order for the plan to succeed the county needs to get it out to the citizens to tell them what's going on. Maybe some people haven't been paying attention, but I don't think the county could do any more to inform the public. Besides the bike plan meetings, the county recently held an extensive Dialogue on Transportation. Transportation chief Tom Biesiadny noted that several of the bike projects in the plan were included in the Dialogue project list and have been approved by the Board of Supervisors. It's doubtful that between now and Oct. 15 much outreach can be done. Commissioner Hedetniemi eloquently responded that the county has done a phenomenal job of outreach and commended Charlie Strunk, the bike coordinator, for his work on the plan. Speakers highlighted the many health, environmental, and economic benefits of bicycling. Several young people attended despite the late hour, including two young women from Reston who encouraged their fellow students to follow their lead and bike to school. They noted that many kids would like to bike but they don't think it's safe, and the bike plan will help create safer bike conditions. They also noted that biking as an extracurricular activity is prohibited. Several commission members encouraged the speakers to lobby the school board to change the policy. The October 15 commission meeting is on the same night as the FABB meeting. We think it's important that some supporters be present to hear the discussion on the bike plan. One disadvantage of the deferral is that many of those who attended the public hearing will not be present for the discussion that precedes the vote. We hope that some of you can attend the Oct. 15 meeting beginning at 8:15 p.m. FABB will discuss the conflict with our meeting and determine whether to postpone our meeting or perhaps change the meeting location to the government center. Stay tuned. Update: If you were not able to attend the meeting, you can see the video of the public hearing.